Love to add a bit of colour to your home but not sure where to start? Using too many colours can be overwhelming and make the home look too busy but this lovely apartment in Budapest, Hungary shows us exactly how they used colours in a really cool and unique way without being too overbearing. The first thing they have done to the apartment is to use a white palette throughout the home to keep the whole look seamless. Since they wanted more colours and felt that white was too boring, pops of bright and vibrant hues are seen for a really fun and cool atmosphere. In the living room, quirky elliptical light fixtures on the ceiling continue down onto the walls are all in a different vivid hue which makes it seem like they are colourful birds in motion. 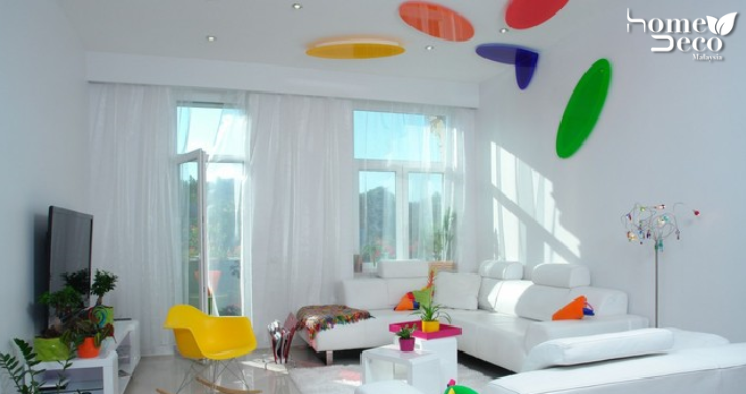 The chair, cushions, tray and flower pots are bold and bright to help liven up the room as well. You can also spot the same theme in another corner of the room, where a daring red armchair is tucked cosily there and accentuated by a cute fish pillow also in bright colours. Meanwhile, the kitchen has lesser splashes of colour but the ones that are there, such as the red running board and a few kitchen essentials ensure that it doesn’t look boring. Of course, once you turn on the lights, you can see how stunning the overall effect is thanks to the glowing LED bulbs used. The bedroom and bathroom follow suit with the white theme that is coloured with pops of vivid hues. The bedspread is white with blocks of red but the bathtub steals the show with a whimsical rug that looks like they are bubbles interspersed with colours. The vanity room and the work area are eye-catching on their own which uses mainly primary colours that are not too loud as it is toned down by the white background.